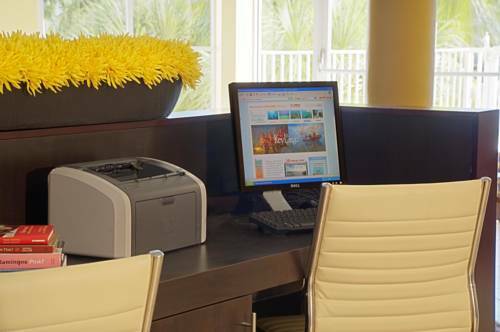 An oasis of comfort and convenience, Courtyard Marriott Key Largo is the perfect place to stay for vacations and business travel alike. Providing easy access to John Pennekamp Coral Reef Park, Dolphin Cove and Jacob's Aquatic Center, our hotel in Key Largo boasts a convenient location footsteps from all things Florida Keys. Before hosting a business meeting in our event space, or swimming in the waters of the Gulf, get a good night's sleep in our Key Largo hotel's plush bedding. Share photos of your trip using the free Wi-Fi, or spend some time unwinding with premium cable and movie channels on our flat-panel HDTVs. Visit The Bistro when you get hungry to enjoy a delicious breakfast with Starbucks coffee, or dinner entrees paired with handcrafted cocktails. Squeeze in a workout at our fitness center using our free weights and cardio equipment, or go for a refreshing dip in our outdoor pool. Whether you're meeting potential clients or swimming with dolphins, make your stay a success at Courtyard Key Largo. The Bistro Eat. Drink. Connect. : Your food and beverage destination for breakfast choices in the morning and dinner, beer and wine options each evening. The Bistro, our hotel in the Florida Keys' restaurant offers beverages made with Starbucks coffee to help you jump on each day!